Legacy blog for A Different Kind of Luxury, now The Abundance of Less: What do you think Oizumi's motives are? What do you think Oizumi's motives are? In the first chapter, Oizumi appears to lead a much more simple life than the one he grew up in. While I applaud the way he has embraced tradition, I’d like to hear more about his motives. One could say that he serves as an example to others in hopes that one day he will leave a better world than the one he grew up in, but would some accuse him of running away from society? Thanks for the question Doug. 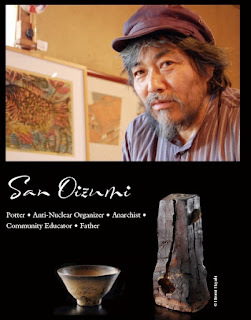 Actually Oizumi is very engaged in society, working to prevent a nuclear waste dump in his rural area, and being in dialogue with people of all political stripes. I love how he’s managed to do so without alienating people, but really including everyone from government bureaucrats to kids to homemakers. The grain is a mix of seed grown near the proposed nuclear waste dump in Oizumi’s region of Japan and some harvested in the small village in the far north of Honshu Island at the village of Rokkasho, where Japan’s first plutonium reprocessing facility is being built. The plant was hugely controversial but was rammed through despite massive opposition locally and nationally. Oizumi’s idea is to have local bakers and housewives make cakes and breads from this flour as a way to start discussions about who would want to eat such food once these facilities are in operation. It’s brilliant, I think, be­cause it breaks through barriers that middle-class propri­ety usually erects to political conversations. I imagine the sitting rooms of many stay-at-home mothers becoming animated with concerned discussions begun by the simple device of these cakes being served. Oizumi's stratagem is yet another way to bring his critical ideas into the conversa­tions of the mainstream Japanese public with its love for regional specialties. One of the things I wanted to show in A Different Kind of Luxury is how we can both be involved in our society, and also live lives of great richness with very little money. Oizumi's home, his creative ways of solving problems with panache, as well as his stunning pottery show how much we can accomplish--and enjoy life too--if we give up on the constant struggle to make as much money as possible, and if we forego all the blandishments to gain higher status for ourselves.